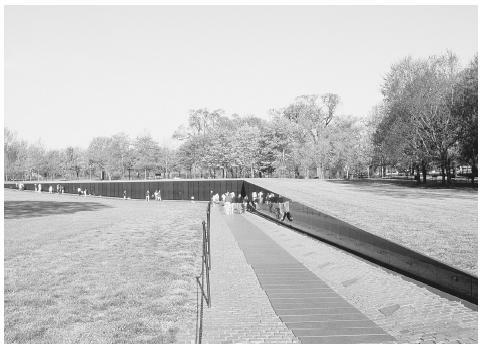 Maya Lin, a Chinese-American student at Yale University, designed the Vietnam Veterans Memorial Wall to be reflective— those stopping to read the names can see themselves reflected in the highly polished surface. In order of date of death, names of the over 58,000 American missing or dead are chiseled into the granite without reference to rank or branch of military service. community, many veterans and conservative politicians were outraged at its selection. Critics targeted features that distinguished the design from other memorials, saying it was black instead of white, horizontal and in the ground instead of rising upward, abstract rather than a realistic depiction of soldiers or battle, and devoid of any patriotic symbols. The most influential of the critics was James Watt, Secretary of the Interior, who put construction on hold until the VVMF agreed to supplement the wall with more traditional patriotic symbols. See S UTTON H OO .